Why do kids make excuses? Here’s the truth: It’s really not as important to know why they do it as it is to know how to deal with their behavior. When you think about it, we all make excuses from time to time. You might know the speed limit, but when you’re pulled over by the police you may try to justify why you were speeding by telling the officer that you were late for work. This is the same thing children do when they say things like, “The teacher didn’t explain the assignment—that’s why I couldn’t do my homework.” And your child is not the only one—all kids try to wriggle out of consequences for their mistakes or for bad behavior. Kids see this happening everywhere—on TV, in the classroom, with their friends and even from us. Keep in mind that while your goal is to teach your child to take responsibility instead of blaming others, his goal is probably to get out of being punished. Chronic excuse-making in kids may start out subtly. The trouble begins when blaming others works to get them out of consequences. This is when it can become a much bigger part of their personality because they’re using it to solve their problems. Why is it so important to address excuse-making? As your child grows up and becomes an adult, the people in his life won’t accept excuses for his behavior. His high school and college teachers won’t accept them, his spouse won’t want to hear them all the time and his boss certainly won’t put up with it. The legal system doesn’t really care about excuses, either. One of the best things you can do is catch your child when he’s blaming someone—or something—for his actions, and then call him out. You can say, “It sounds like you’re blaming your friend for the fact that you came home past curfew without calling me.” Turn it around and let your child know that no matter what, in your eyes, they are accountable for their own choices and behavior. Don’t let yourself get confused or drawn into an argument. Stick to the facts. What is the problem behavior? Is it that your son hits his siblings, or your daughter doesn’t do her schoolwork? Once you recognize the behavior, you can name it and then get your child to look at it. Again, avoid being sidetracked. Be clear about what you see and what happened. Don’t let them get away with changing the subject, because, in the end, it will only hurt your child who’s blaming everyone and everything for his bad behavior. Name the behavior that is the problem (for example, not doing assigned homework), name the choice they made (not asking for help), and then come up with one or two different things your child could do next time. (Ask for help from the teacher or talk friends in class.) Reinforce the plan—and keep it simple. If your child can’t come up with an idea, you might help them. This works well with kids and gives you—and your child—a more objective way to look at the situation. Your role as a parent is to set limits, teach and coach your child. Part of that is to actively teach what is appropriate and what isn’t through role modeling. So you’re modeling taking responsibility for the behavior, and you’re letting your family know how you will try to handle it in the future. Commit yourself to the process of challenging faulty thinking in your child—and keep at it. 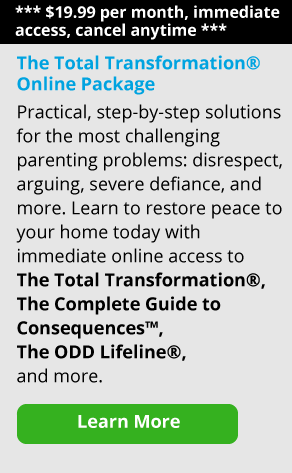 Just because you’re able to cut past the excuse to the behavior one time doesn’t mean the behavior is going to stop, or that your child won’t find another way to deflect or change the subject. You have to commit yourself to address the behavior and be vigilant. Doing a role-play where your son plays the part of his brother and you play his part can be helpful. During this role-play, you can practice what he can do next time this happens. That will give him an additional skill, and will help him not only own his behavior but will also give him a problem-solving skill other than hitting. Be sure to tie the consequence you give him to the behavior. If your child has knocked his brother down, the consequence is for that action. The fact is that your child chose to respond to that situation by using force. All the excuses in the world don’t change that. Maybe his little brother shouldn’t have been there, maybe he shouldn’t have grabbed his cell phone. But no matter what, it doesn’t take away from the fact that he chose to knock him down. Once your child acknowledges his mistake, have him make amends if the situation warrants it. If your son hit his sister, he may need to write a note of apology or do a chore for her—but after that, move on. It’s a very difficult thing to learn to take responsibility for behavior but once you start, it gets easier. 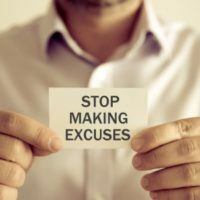 Realize that everyone makes excuses, but the most important piece is taking that responsibility and making amends. It’s empowering to know that we all have choices in life—and that goes for your kids, too. They’re making a choice to either follow the rules or not follow the rules. In any given moment, they choose between right behavior and wrong behavior. If your teen daughter is with friends and realizes she is going to be late for curfew, she has the choice to text you and let you know or to call you to ask for a ride. Blaming her friends for her inability to get home on time is not a valid excuse. She’s not a victim or powerless to change the outcome of her actions each time she steps out of the house. Remember, the more your child takes ownership of her actions, the more empowered and responsible she will become.